Our last little newsletter created an unusually large response, more than twice as many people as “normally” wrote to us, many of them asked questions. With over 4 000 readers of Flax Mill News (in three languages) now, it is almost impossible to answer every mail personally but this time many communications were about two particular points, so we’ll try to give a few details on them. It’s done in a straight mail, our next newsletter will be out for the end of April (by then we will have the problems with our template sorted, I promise…). – Shanes Castle Steam Rally on May 5th & 6th. * Yes, the location is at the shores of Lough Neagh (for readers from elsewhere: Ireland’s largest fresh water lake) outside the town of ANTRIM. The very picturesque grounds of the country’s largest private estate (home of the O’Neill family) make for a great setting. The organisers rent the grounds for the event. * No, we are not the organisers of the Steam Fair, the “Steam Group” have asked us (as in recent years) to put togehter the demonsration “From Flax to Linen” in the large crafts marquee. * Yes we are actually weaving, spinning, warping and scutching flax at the event! * Yes, we have a very large sales-stall and people can order goods beforehand (makes sense for customers from Belfast for example, Antrim is less than half the distance to Flax Mill away from them…) also quantities of cloth for whatever you are producing. Just give us a ring before the event and we’ll have your order there. * Yes we will take all the time you need for a quiet chat or all the detailed information you are looking for – we are not located near noisy fun-fair items etc. – our stall is designed to accommodate individual visitors as well as groups of folk who want to see. So much maybe – finally the Opening Times: The Rally is open to the public from 10 am to 5 pm on both days! I hope this has answered some of the questions, see you at Shanes Castle! *Yes, we always keep stock of several (at present 4) types of linen finished by beetling (the oldest known method to finish linen). * No we don’t beetle ourselves – the only commercial beetling plant on this island does the job for us. Since 1736 (!!) our friends at “Clarks of Upperlands” have been using this superb technique – no one has more experinece in finishing the “aristocrat of textiles” than the oldest linen mill in Ireland. * Yes, we are known as the “inventors” of dry – beetling, though I think, it has been done before I re-discovered the “non starch” method to be able to use the finish on outer – surface cloth such as shirts, table -ware, etc. Why Beetle – Finished Linen? – It’s a pure mechanical finish, no chemicals used at all! – It produces a density of the cloth and shine which is unsurpassed by any modern method. – Clark’s plant is just 16 miles from Flax – Mill, no carbon footprint with shipping cloth all over etc…. I hope this has added a bit of information and brought some clarity for some of our readers. 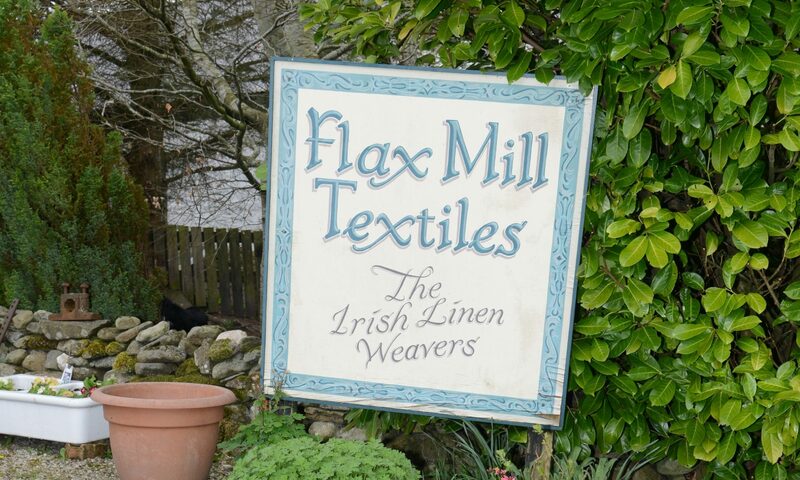 For any other details, be sure to send us a mail or give us a ring (02877742655) or better: Call to Flax Mill (or to Shanes Castle on May 5th and 6th) and we’ll sort out linen, the world and all that ….over a good cup of coffee of course.